Turtles are messy pets and many pet turtle owners fall into the trap of thinking that dirty and muddy water is fine for the turtles. Even though turtles may live in a dirty water, it’s not the ideal situation as it may ruin their health. We know, it’s not often to see a turtle floating at the top of the tank belly up. 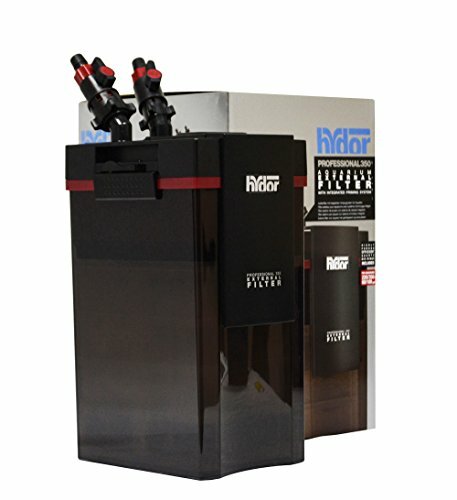 What counts when choosing a filter? There are several things to take under consideration when choosing the filter for the turtle tank and you should check them in order to make the best decision. The size of the tank is one to begin with and you need a filter that matches that size. Take a good read of the details of the filter to see if it fits your tank or not. The motor of the filter is also important as it has to be dependable and effective. You also want it to be easy to take care and reliable as the whole filtration system depends on it. If the motor is stable, so is the whole filtration system. Don’t forget to check the noise level on the motor as you don’t want your turtle all stressed out because of the noise. The setup is another thing to think about and you always want a filter that is easy to install. You want the filter to fit exactly the tank, but also one that doesn’t require much of your time and attention. Take a look at the durability of the filter too. The longer the life span, the easier it’s going to be for you on the long run. Which one is the best for your turtle tank? Ask around, get online and talk to the other turtle owners. However, the best choice for your turtle tank has to fit your wallet too. However, the more you pay, the more you can expect in terms of reliability and durability. 1). Shopping on a tight budget is no picnic and you’re not far from a great choice when getting a filter like the Aqueon Quietflow Internal Power Filter. As a matter of fact, there are many good things attached to the filter and the first to begin with is the fact the filter is entirely submersible in both vertical and horizontal position. You may adjust the return flow rate, but also the direction and height of water return. The filter provides three-stage filtration and needs Aqueon Replacement Internal Filter cartridges. The dense foam catches particles and debris, whereas the activated carbon eliminates odors, toxins and discoloration. The patented BioGrid takes care of the ammonia and nitrates, so that all sorts of filtrations are accomplished (mechanical, chemical and biological). The filter is a good choice for the 40 gallon tanks and has a flow rated of 155GPH. The suction cups are reliable too. The slim design makes the filter easy to place, but also improves its look. The filter is easy to install and to clean, running pretty quiet. Nevertheless, for the money you’re paying, the filter is a dependable choice for your turtle tank most of the time. 2). 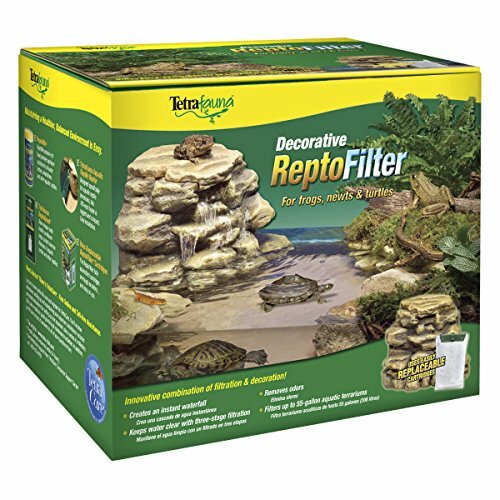 If you’re not only looking for a filter that is functional, but also for a setup that solves the decorative problem as well, give it a try with the Tetra 25905 Decorative Reptile Filter for Aquariums up to 55 Gallons. What you get is in fact a great combination of filtration and decoration and that’s an interesting and useful combination for any turtle tank. The setup lets your design a pretty waterfall and basking area for frogs, turtles and newts in aquariums as big as 55 gallons. The decorative setup includes a three-stage Whisper filtration and you need replaceable Bio Bags for it. The filter keeps the tank clean and healthy for a good amount of time and it only needs 4-6 inches of water for working. The filter features large intake holes so the risk for clogging is low. The pump is efficient and works well. The turtle habitat looks nice and it’s a combination between natural stone design, rocks and vegetation. The setup is easy and the filter isn’t difficult to clean. It’s efficient for removing odors and the locking cover keeps the turtles out of the filtration area. Additionally, it creates a great basking area. The construction seems sturdy and the whole setup is both pretty and functional. Nevertheless, for a good price, you get a decorative setup that comes with a filter for your turtle tank, which is a great combination. 3). If you’re looking for a canister filter for your turtle tank, the Zoo Med 511 Turtle Clean Canister Filter is a great option to try. The filter ensures good aeration to your tank as it comes with a spray bar. The setup is very easy and most didn’t have any difficulties when taking it apart for cleaning either. Using the hose isn’t complicated as they are removable. It may be a bit challenging in the beginning to organize the tubes in order to get more space, but that’s nothing you couldn’t easily do. The clamps are strong so the filter stays in place. The filter also presents an adjustable flow control so you may set up the flow intensity according to your needs. 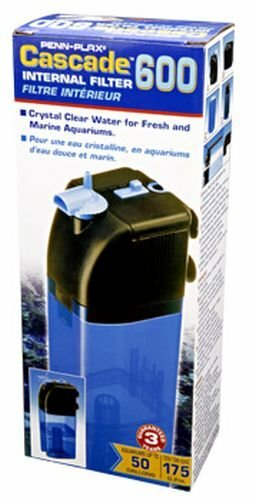 The filter head is easy to open and the filter keeps your turtle tank nice and clean for even a month without need for cleaning of the filter. The list of features also includes the calibrated anti-vibration bushings so the filter runs smooth. It’s a great choice when you want to save more space in your turtle tank, while keeping the water clean at the same time. 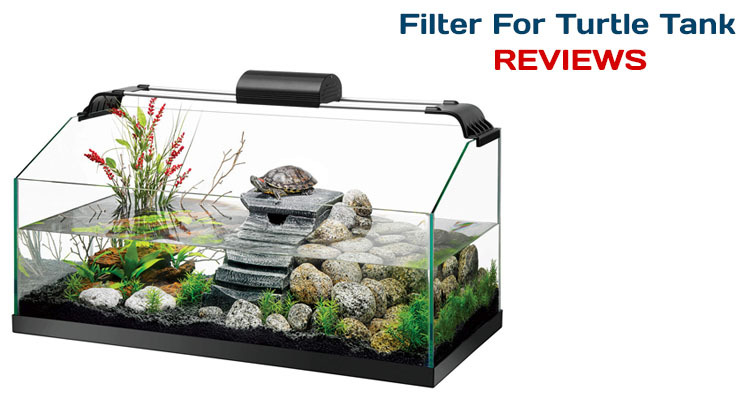 Nevertheless, as it keeps your turtle tank nice and clean, the filter is a valid option anytime and quite a bang for your buck too. 4). 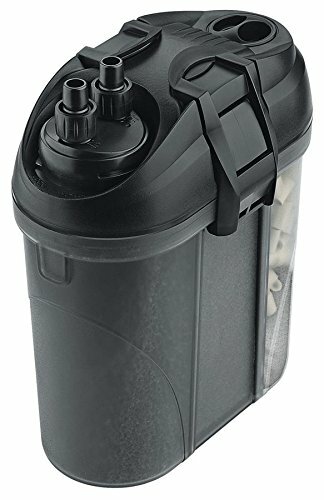 Well-made and reliable, the Hydor Professional External Canister Filter comes with many good features and its downsides are no reason for you not to try it when in need. The filter has a flow rate of 280GPH and it’s a whole eco-system in just one box. Its design is well thought out and the filter provides chemical, mechanical and biological filtration that is going to maintain the risk for your turtles to get sick very low. We like the easy priming feature on the filter, but also its telescopic intake tubes that increase its versatility, giving you the chance to find the perfect setting for your tank. The filter comes with many accessories that improve its performance. 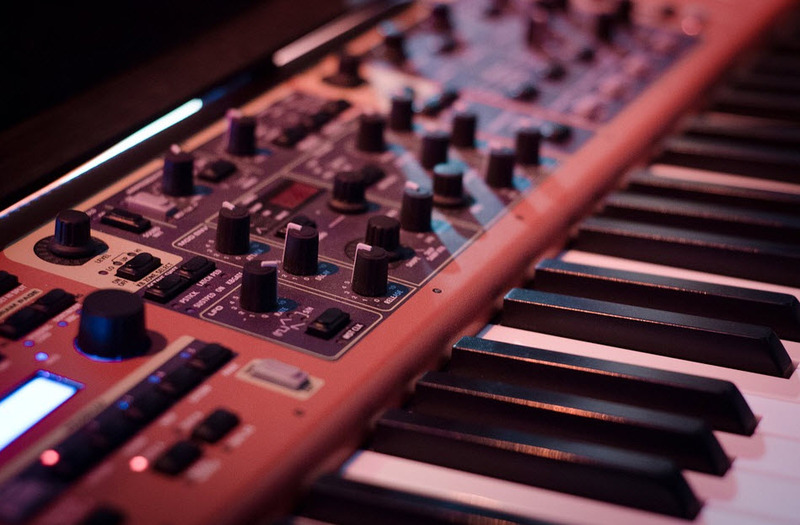 You shouldn’t worry about the vibrations as they’re minimal when the filter is working. The filter manages to clean your tank in no time, in a very silent mode. The perfect fit of the hoses also explains the absence of rattling, which makes the filter quieter. The adjustability is another thing to mention on the filter and you can easily notice the spray bar that lets you adjust the flow rate. The filter has a good build and leaves a durability feel. Adjusting the filter media is a breeze and the filter baskets are efficient. On top of everything else, the filter has a compact shape so it’s not just easy to fit, but also pretty looking. Nevertheless, as it’s efficient, silent and easy to use, the filter still stands as a good investment to make for your turtle’s health. 5). The more you’re willing to pay for the filter for your turtle tank, the more you can expect from it in terms of performance and features. 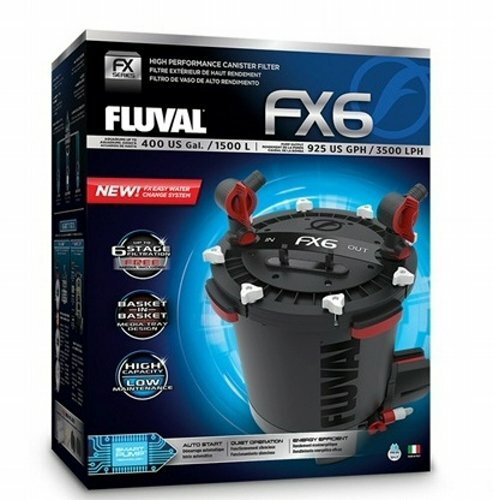 The Fluval Canister Filter, FX6 Filter is definitely not the cheapest filter out there, but it sure is money well spent. The multi-stage filter keeps water clean for freshwater and marine aquariums. 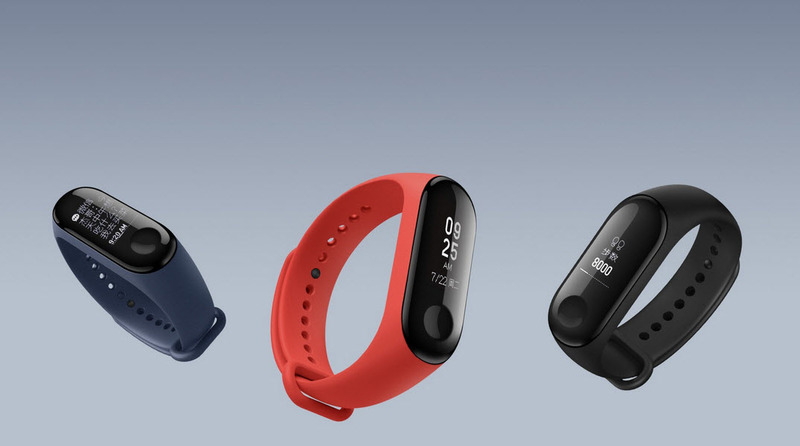 It’s all packed up with an impressive list of features so let’s take a closer look at them. Designed for tanks up to 400gallons, the filter comes with easy-priming Instant-Start system so you never need to do manual siphoning. The filter also features a purge valve drain at the base so it’s always easy to empty the canister before moving it. The Aqua-stop Valves let you stop the water flow with just a 90-degree turn of the valve lever. You can easily separate the hosing from the filter. Additionally, you can also use the valve for regulating the water flow, with no risk for damaging the motor or its elements. The filter comes with two valves: one for the intake and the other one for the output. The performance of the filter comes also from its multi-directional output nozzle that sends several streams of purified water towards the corners of the tank. This way, it creates currents that move the water, for better circulation. The intake strainer of the filter is wide and rounded so the siphoning goes fast. The strainer is supposed to be clog-proof as it’s covered by a screen that repels debris. The filter comes with an electronic circuit board that monitors the impeller speed continuously. The pump always gives good output and the motor does turn itself if the impeller is stopped. On top of everything else, the filter presents a monthly indicator dial that informs you the last time you cleaned the filter and changed the water. All in all, the filter is going to keep your turtles happy and healthy for a long time, which happens to be the most important thing for you. 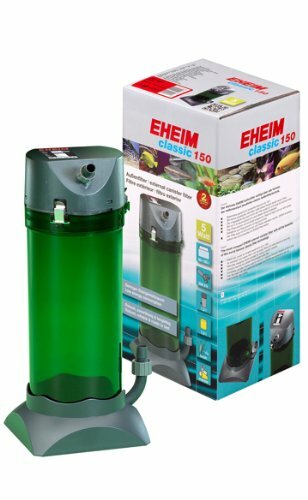 If you’re looking for a canister filter that is going to make your turtle tank look pristine, take a leap of faith with the EHEIM Classic External Canister Filter with Media. The filter runs smooth, but it’s strong. 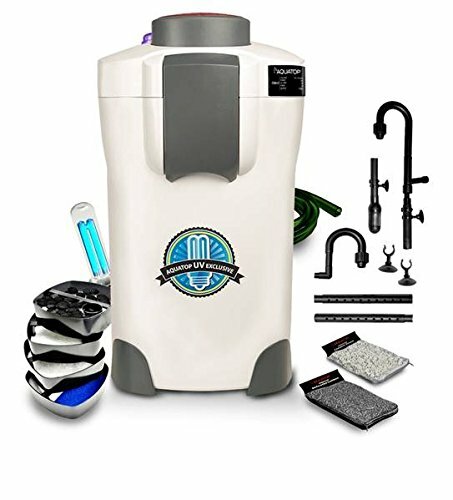 It comes with enclosed media and a filter sponge and an impressive list of accessories: a spray bar, inlet pipe, filter basket, hose and installation accessories. All of these accessories are going to increase the efficiency of the filter. There’s only one process that manages to deliver both biological and mechanical filtration. The water circulation is continuous and the oxygen happens simultaneously so that your pets are always happy. The setup is pretty simple and you can very well install the filter under a cabinet. 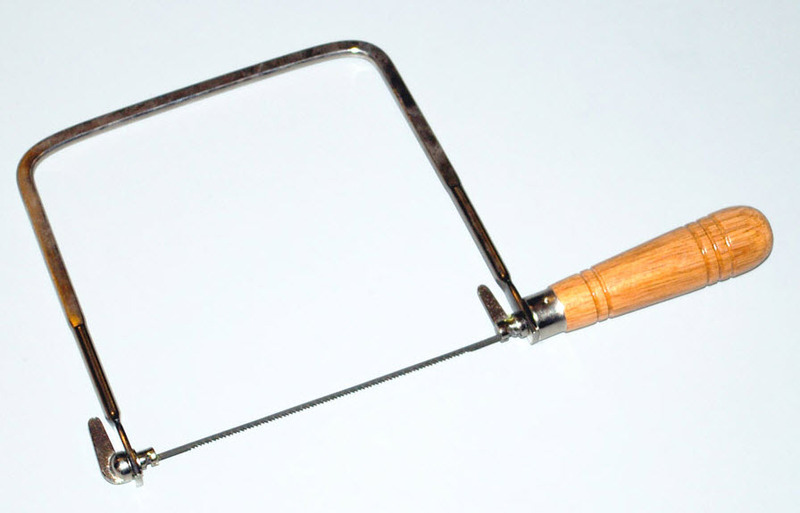 You’re not even going to need to drill holes, but some handy skills wouldn’t hurt. The filter has an easy priming feature too and taking care of the filter isn’t going to take you much effort or time. From the list of features we also have to mention the permo-elastic silicon sealing ring placed on the pump head. This little detail makes the whole difference when cleaning the filter. The filter seems to be well-made and you shouldn’t worry much about its durability either. Nevertheless, as it’s well-made and packed with many good features, the filter is worth to try when in need. One of the best options for the turtle tanks is the canister filter and the Penn Plax Cascade Canister Aquarium Filter sure matches the description of effective and dependable choices for a turtle tank. Big and strong, the filter keeps clean turtle tanks up to 200 gallons, having a flow rate of 350GPH. But it’s not only its larger capacity that recommends it for the use on a turtle tank, but also its functional features and well thought design. For instance, the filter comes with swimming pool style rotating valves that have flow controls, giving you the opportunity to set the filter according to your tank and needs. Additionally, you can very well remove the valves from the canister when you’re cleaning the canister, whereas the hoses, intake and output remain in the turtle tank. We also notice the push button primer that easy to push so that the setup is both fast and easy. The filter comes with 5 large media baskets that you may also customize to your needs and likes. Continuing with our detailed look, we really like that the stackable media trays are large and the multi-stage filtration doesn’t look that difficult to take care of anymore. The directional returns are helpful for suspending the waste matter and the rubber mounter tip-proof base looks sturdy so that the filter stays in place. The flow rate is continuous and silent at all time and the air-tight seal has a lot to do with it. It’s not difficult to lift the clamps nor to release the vacuum. You’re not going to find it difficult to remove the top either. Even though the looks are the last thing to check on a filter, it’s important to note that this one comes in a nice cobalt blue color that is going to give a cool and playful vibe to any turtle tank. It goes without saying that the filter is a wise investment to make for your turtle filter and you shouldn’t sit on the fence when seeing it. 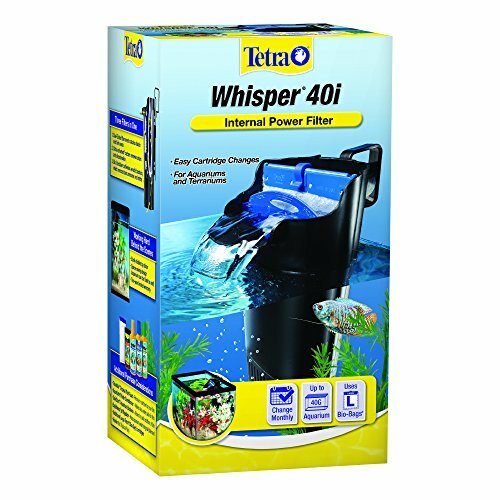 Quiet and soothing for your little pals, the Whisper In-Tank Filter with BioScrubber for aquariums is both efficient and affordable, which makes it quite a catch for many. The filter is designed for up to 40 gallons’ aquatic turtle tanks, but it comes in various sizes so you can definitely find your pick. Versatility is one of the filter’s features as you may easily hang it or use one or two suction cups for installation. The filter is a good option for mounting it on the inside of your aquatic tank. The motor is under water so the filter is very silent. It only needs 2 inches of water for it to work, making it as a valid choice for the aquatic turtle tanks. Additionally, the motor is quite strong and manages to clean your tank in few minutes. You can also use the mounting suction cup and the bracket for setting the filter to high or low water levels. The filter comes with pre-assembled Whisper Bio-Bag filter cartridge. Accessing the filter cartridge for cleaning isn’t difficult either. The filter is silent, efficient and safe for the aquatic turtle tanks and you’re not taking a high risk when getting it. 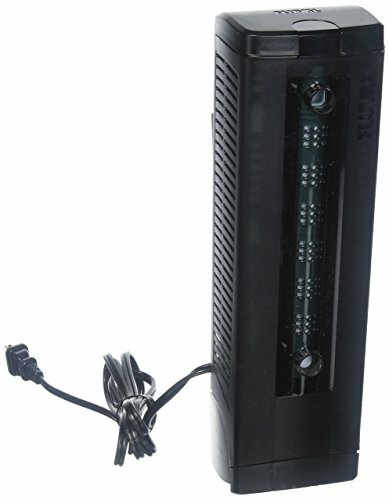 Fully submersible and effective, the Penn Plax Cascade 600 Submersible Aquarium Filter Cleans Up to 50 Gallon Fish Tank gives a 175GPH of clean water for the marine or fresh aquarium, ranging from 20 to 50 gallons. The filter comes with activated carbon cartridge that eliminates toxins, odors, harmful chemicals and anything that contaminates your turtle tank. As it provides three-stage filtration, the filter comes with an internal sponge that improves the colonization of “good” aerobic bacteria. 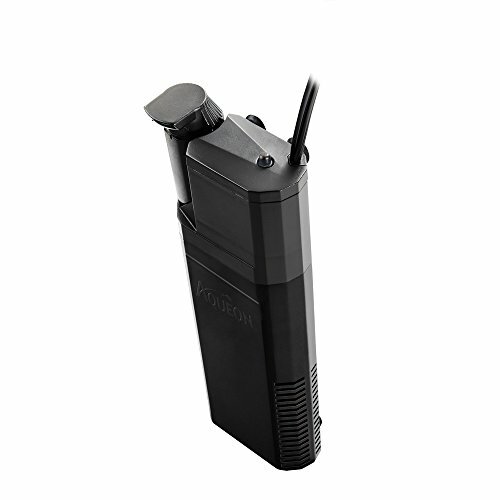 The filter is packed up with good features like the adjustable pump head and directional water flow. The cascade internal filters improve filtration. The filter gives chemical, physical and biological filtration, but it also aerates the water. The spray bar option lets you distribute water evenly and aerate the tank. You may very well place the filter horizontally. 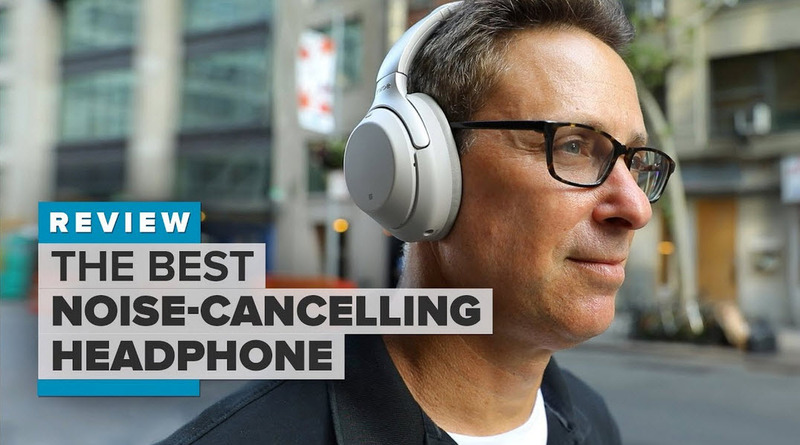 Its slim design and low profile is easy to hide, anyways. The Venturi air tube ensures oxygen-rich filtered water to your turtle tank too. Well-made and sturdy, the filter runs smooth and quiet. However, as it’s efficient and fully submersible, the filter is a great choice for your turtle neck and affordable too. Powerful enough to keep your turtle tank nice and clean for quite some time, yet silent enough not to disturb you, the Fluval Underwater Filter is sure worth to try whenever you want to step up your game for your turtle tank. The filter is very easy to install and taking care of it sure is a breeze too. You can use the filter as a stand-alone filter or as a supplemental filter, in case the external filtration isn’t possible. We like that the filter comes with a 3-way flow control with adjustable output, so you can set the flow according to the needs of your tank. The filter also comes with 2 foam pads that ensure a pretty efficient chemical filtration. The 2 poly/carbon cartridges catch the fine debris, increasing the water clarity and eliminating impurities from the water. As for the stage 3 of the filtration system, it’s the BioMax that ensures the biological filtration. The filter is very flexible and comes with a bracket system that makes the removal a breeze. The suction cups are attached to the bracket and you don’t need to remove them for cleaning the filters. You can add activated carbon pellets and the filter keeps the water crystal clean. It runs silent so there aren’t many things to complain about. Long story short, the filter is powerful, silent and affordable and it keeps the tank clean, in a silent mode. What else do you need? Made to keep water clean in tanks up to 175 gallons, the Aquatop CF Series Canister Filter comes with many good things attached to it and you shouldn’t worry about its inherent flaws. The detailed description begins with the UV sterilizer of the filter that is able to eliminate once and for all the algae spores and the harmful bacteria. Hence, the filter provides a 4+1 stage filtration system. It comes with fine filter pads (white) and 1 coarse filter sponge (blue) that improve the Mechanical filtration. The filter also features 3 large filtration media compartments that give you the chance to use your favorite media. The filtration system isn’t complete just yet and we need to mention the Premium Activated Carbon, the Ceramic Rings and the Bio-Balls. All of this components are working together and the filter cleans the water, keeping the tank pristine. 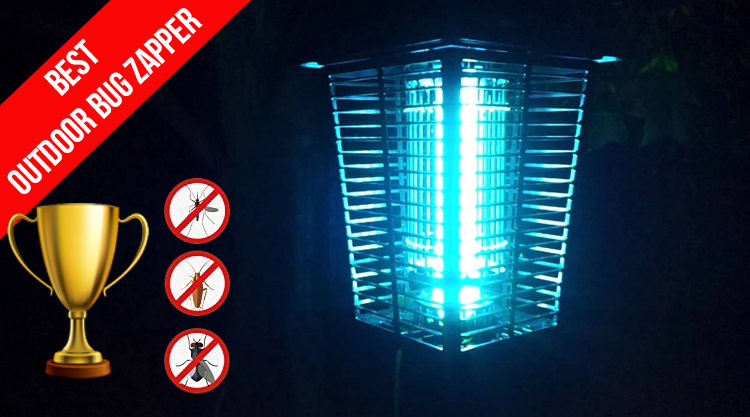 The 9-watt UV sterilizer works well and the filter is silent and efficient at the same time. The filter is easy to use, easy to clean and it’s easy to change the water as well. Highly customizable, the filter is money well spent for a large turtle tank. For what it’s worth, the filter is a safe choice and a good investment to make for a large turtle tank. 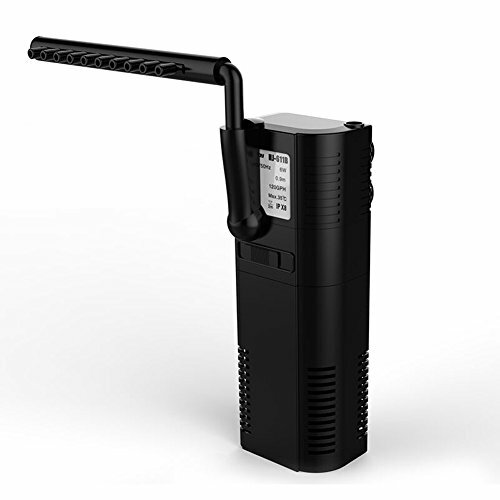 Designed for the smaller turtle tanks, the SongJoy 120GPH Submersible Filter Pump for Turtle & Aquarium is a versatile and dependable filter that comes for a great price too. You may use it for indoor and outdoor turtle tank, but also for modeling rain fountain and so on. It has two configurations. One is the decorative rain shower and the other one is made to improve the oxygen content of water accessories. The filter comes with nitrocellulose sponge that catches the large impurities and sustains the growth of the “good” bacteria. Additionally, the filter also features an activated carbon box on the water turbidity that clarifies the water. On the back of the pump, you’re going to notice a regulation switch that allows you adjust the flow. Made with high-quality plastic materials, you can use the filter as an oxygen pump too. It’s ready to use out of the box and runs silent. The motor is made of copper, with no aluminum or aluminum alloy. This is why it improves the heat dissipation and efficiency. The filter comes with two types of outlet connectors and it’s easy to take it apart for cleaning. As long as you’re focusing on the good sides and take a look at the low price as well, you’re on a safe side when getting the filter.